With kids preparing for school and vacations in the past, summer is coming to an end. As we look to the fall, we need to prepare for mold season. Mold can damage your home or office, and can even affect your health. Any water damage, dampness or moisture can lead to mold growth on walls. But you may be surprised to know, it can even grow inside air condition systems and spread throughout your indoor environment. Fix Leaks – Check roofs, foundations, and faucets regularly. If you happen to see any moisture, repair immediately to decrease the amount of mold growth. Remove Excess Moisture – Check windows and HVAC units to ensure there is not pools of water which can lead to mold. Remove any wet materials immediately. Keep Humidity Under Control – keep your work humidity below 60% (ideally 35-45%). Check for Odors – the first sign is mold is a musty smell. Don’t closely inhale the odor so as to not sniff mold spores, but check for any change in scent in dark or damp areas. Let Walls Breathe – Open your windows and doors to allow your home or office to get fresh air. If your office is closed for an extended period of time, assign an employee or coworker to open the office for a few hours and check for any dampness or change in odor. 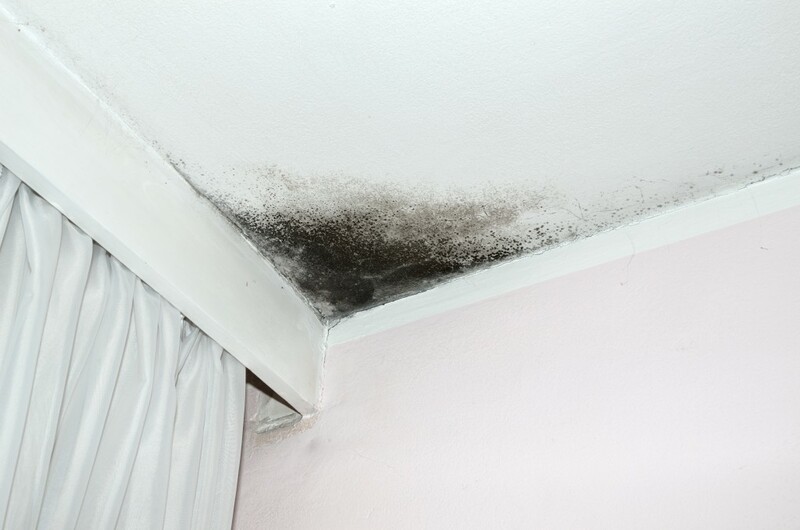 If you do notice a dampness that has sat for some time, or an odor, you need to check for visible mold. Mold will appear cottony, granular, or leathery and can range from white, gray, brown, black, yellow, or green. If you do find visible mold, you will want to verify the source of the moisture. Once the source or leak that caused the wetness is fixed, you then need to contact a remediation company to remove the mold. The general public has come to believe spraying bleach water on mold will kill the spores and prevent it from spreading. Although bleach can aid in mold on non-porous surfaces (ie. tile), it does not aid in porous surfaces (ie wooden beams). Without professional help, you may be able to stop the mold, but not permanently as mold can grow and spread in other areas. Because of this, OSHA and EPA recommendations do not include bleach water, but a full remediation of the area. Only a full remediation allows mold to be killed at its roots. If you choose not to remove the mold growths, you and your staff are at risk for health effects that mold exposure can cause. This is dependent upon the amount of mold and the individual’s sensitivity to it. Long exposures can cause coughing as well as nasal and throat conditions. People with a weak immunity system can also develop serious respiratory infections. Many times you will want to clean the air ducts within the effected environment to ensure a full cleaning of the breathable air. Between a safe removal of the visible mold and clear air ducts, you and your staff will be in a safe environment once again. It is best to contact a company who can handle the mold remediation as well as the air duct cleaning. Alliance Environmental Group specializes in mold removal and air duct cleaning to remove mold and odors associated with it. Call (877) 858-6220 for a free quote.